Ben Stokes will join the England squad in New Zealand after appearing at Bristol Magistrates Court on Tuesday on a charge of affray. The first hearing of Stokes' trial is scheduled for Monday, 12 March at Bristol Crown Court, although he is not required to return to the UK to attend it. Stokes, who missed the recent Ashes series which hosts Australia won 4-0, will arrive in Hamilton in Friday, where England face the Black Caps on Sunday. However, an England and Wales Cricket Board statement said Stokes "is not currently being considered" for the ongoing T20 tri-series, which ends on 21 February. England then play five one-day internationals and two Tests against New Zealand. "Any decision to include him in upcoming matches will be made by head coach Trevor Bayliss and the England management team," the statement added. "As soon as he was available to come we wanted him to get out here," Bayliss told BBC Sport on Tuesday. "I think getting back to cricket will be a relief to him. He's an out and out sportsman and that's what he does best." Stokes has not played for England since an incident outside a Bristol nightclub in September. Stokes played six domestic matches in New Zealand in December. He appeared in three one-day games and three T20s for Canterbury Kings after being cleared to play by the ECB. 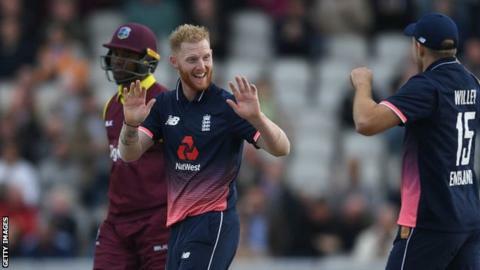 Stokes returned to the UK to spend Christmas with his family and has been given permission to take part in the Indian Premier League, which starts in April. 11 October - Stokes loses his sponsorship deal with sportswear brand New Balance. 27 November - The ECB issues a statement denying Stokes is joining England's squad after a picture is posted on Twitter which it is said shows him at Heathrow Airport. 15 January - Stokes is charged with affray. 13 February - Stokes granted unconditional bail after appearing at Bristol Magistrates' Court.